6 miles from Helen, Georgia. Unlike some cabins, this one actually has beautiful views of the Blue Ridge mountains from all windows. Lovingly called Bear’s Den, this cabin boasts custom themed décor and wood carved details throughout. Upon arrival you will be sure to notice the four foot carved bear at the cabin’s entrance. This cabin is on a large lot and has plenty of space for walking a pet. A new rock fire pit with wooden benches is out the back door. It's great for making smores, cooking, telling fireside stories, and a nice backdrop while in the hot tub. Blueberry and blackberry bushes are plentiful in the summer and make a nice ingredient to your pancakes! Inside, large paned windows in the living room and kitchen make for great mountain views and beautiful sunsets. French doors in the living room open up to a spacious wooden deck, perfect for entertaining, viewing wild life, or catching a glimpse of a falling star. New wicker rockers will provide hours of enjoyment. If you prefer to stay indoors, you can snuggle up on the leather couches, take in the warmth of the wood burning fire, play a game of pool, watch VHS or DVD's on the large flat screen television (flat screens also in each bedroom), use the stereo, play pool, or have some fun with our mounted deer that sings and talks. The cabin is kid friendly and is enjoyed by my 4 grandchildren ages 3, 8, 12 and 16. No need to worry about stairs, our cabin has an open 2 bedroom/2 bath floorplan. Each bedroom has a private bath, flat screen television, and hand-carved, log, king-sized bed. You will love the bear and deer themed quilts and décor in each room. The master bedroom also has French doors that lead to a six-person hot tub & two propane grills in the second porch area. Perfect for relaxing after a day of hiking, tubing, visiting the local winery, or shopping. The screened porch has a hot tub, gas grills, and a table and chairs. You will not have to worry about the details in this cabin, we have thought of everything. The kitchen is fully equipped with lots of extras (including Kuerig coffee and waffle iron and all bed/bath linens are provided. The cabin even has a washer/dryer for your convenience. If you are in need of extra sleeping space, a queen air mattress is available upon request. So many people have enjoyed their stay at Bear’s Den that we are sure that you will want to come again. For the holidays, we have a decorated tree, lighted village, and outside lights to make your holiday bright and cheerie! Be sure to book your winter get away now! Helen has a great light display throughout November and December and don't forget Oktoberfest as well as many other festivals in Helen! Keywords: 2 bedroom cabin, mountain views, close to Helen, luxury cabin, mountain home, mountain getaway. hot tub, outdoor fire pit, king beds, 2 bedroom home, Helen, Oktoberfest, pool table, tubing. I am a grandmother of 4 and mother of 2 wonderful children. I live near Helen and try to visit my cabin as much as possible. It is truly my escape and I have put my heart and soul into all of its furnishings. I really enjoy the peacefulness the mountain views bring me. The simpleness of the town and its people remind me of how busy our regular lives can get. We need to stop and recharge once in a while and remind ourselves to simplify, be grateful for God's gifts and our own talents. Central Heat and fire place in Livingroom. Bed sheets, pillow and pillow cases, bath towels, kichen towels. Fire-wood provided. Also fire pit in back. Guests asked to leave $7 to maintain seasoned wood. Microwave, Kuerig coffee pot (with coffee), toaster, blender, waffle iron, full fridge, range, dishwasher. In living room and each bedroom. Outdoor rock fire pit with wooden bench seating. This pic of the side of the cabin does not do this cabin justice. It is so very cute from the front and back, plenty of parking, porches overlooking the mountains and the fire pit. Hot tub on the screened in porch with provided towel wraps! We stayed over Christmas when it was rainy and cold, but we were warm and cozy inside with our beautifully decorated tree, fireplace and large TV with DISH. The bedrooms were oh so comfortable. Only downside is my disabled husband had some trouble climbing in the very high beds. We chose this one because it was one level, and that helped a LOT. The views are spectacular and it is only a 10 min drive to downtown Helen. We enjoyed it so very much! This cabin was a great place to get away. It was clean, well stocked with necessities, and had great amenities. I would stay again. Cute and convenient place. Close to Helen, Georgia and Anna Ruby Falls which we took in the sites. Very homey and they have thought of everything you might need. Beds were very comfortable. Had an enjoyable stay! I am so happy you enjoyed your stay! Hope you visit us again! My husband and I enjoyed a wonderful, peaceful weekend at this charming cabin. We sipped coffee on the large porch as we watched the sun rise. Enjoyed the beauty of the sunsets behind the mountains. The cabin is completely surrounded by forest so you feel completely isolated while being just minutes from Downtown Helen and Unicoi State Park. My husband and myself rented this cabin because we were attending a wedding in Helen. Let me tell you that this cabin came stocked with everything you could need. Coffee, condiments, wine glasses, plenty of bedding and towels, exc. The beds were comfy. Pam had great communication and there was clear instructions on how to use the hot tub and what to do upon departure. The town of Helen itself was so charming and beautiful. We will definitely be back! I am thrilled that you enjoyed your stay! I look forward to you visiting again. We enjoyed our stay at The Bear Den. The decor was beautiful but the cabin was still comfortable. We had all we needed and the beds were comfy. 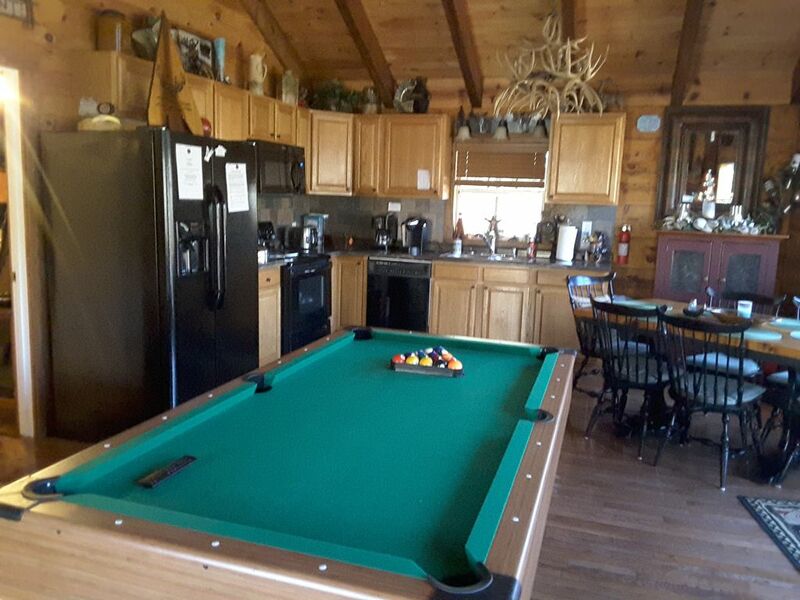 With hot tub, grills, fire pit, horseshoes, pool table and beautiful views there’s no reason to leave the cabin. If you do, Helen is nearby as well as trails in Unicoi State Park.